The deadline for submitting an application for the upcoming Summer Session in International and Comparative Law has been extended until April 25. The program has been approved and will definitely take place. However, there is still room for an additional five (5) students from Marquette Law School or from other U.S. law schools. Every year, the four week Summer Session in the town of Giessen provides a fantastic opportunity to receive 4 law school credits while studying alongside an international student body and experiencing German culture. Program participants can choose two courses from among four offerings: 1) Comparative Constitutional Law; 2) International Economic Law and Business Transactions; 3) Cyber Law; and 4) Business Ethics and Human Rights. Two multi-day field trips — to Berlin and Hamburg — are included in the fees. The program takes place from July 15 until August 12. For more details, please visit the Study Abroad webpage, where you can also find more information on the tuition and fees, details on the course offerings , and where you can download an application. Don’t delay, as the program will fill up quickly. 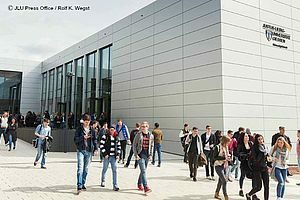 Photos: Above, students walk in front of the law school building at Justus Liebig University. 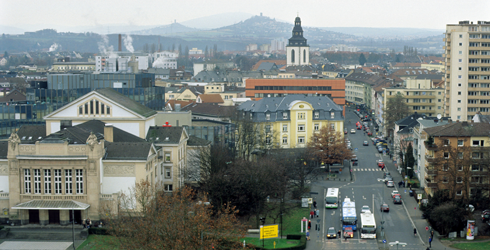 Below, a view of the Giessen City Center, with Bell Tower and Opera House.